I HATE THOMAS THE TANK ENGINE. now the truth can be told. ugh, i hate Thomas. i wish i’d never innocently introduced him into my son’s life. now i can’t “disappear” him because my son uses Thomas as a social tool; it helps him define his little niche in the playground ecology. he’s become known as “the boy who likes Thomas!” it makes him happy, especially after our not-as-successful experiment with superman. at the Cutie Nubbin’s old preschool, there was a boy who was really into superman–he had the homemade cape, the lunchbox, the doll…cough… i mean, action figure, the 3-D brawny foam chestpiece with C-cup pecs and 6-pack abs, etc. CN also had a rather fabulous red velvet cape emblazoned with the famous superman S, but i know he always found it tiresome to compete with the other child’s superman worship on the days they both wore superman stuff to school. it was just too hard to occupy the same pop cultural niche, in spite of everyone affirming the TWO wonderful supermans. both/and is a hard concept to grasp for college students, so why would it be any easier for toddlers? so now at his new school, he’s taken up Thomas worship as his defining characteristic. it makes sense, as the new school is on a compact urban campus where big sandlots (and hence, Bob the Builder/bulldozer worship) aren’t possible. the compact urban campus does have many many Thomas trains and tracks, so there’s actually a social arena for his worship to manifest and be appreciated and understood by the other children. plus his teacher ms. J read a Thomas book to him the first day he came to visit the school, so it’s strongly identified with the new school, new teacher, and new surroundings in his mind. and there’s no competition for CN’s niche; hunter likes dinosaurs and power rangers, and christian and the other little boys are presumably into other things. so there are meta-reasons why i tolerate moderate Thomas worship. i want my kid to feel there’s a way for him to express who he is through what he likes (through his toys, but not the only way, obviously) and to fit into a larger social landscape. so why do i hate that seemingly innocuous little blue train? oh, let me count the reasons why. too expensive. each freakin’ train costs $17-20! i’m of the school of thought that toddler toys should cost between $5-10, because it’ll only last for 20 minutes before the box gets played with. there are 3 non-compatible lines of Thomas stuff: the legos, the aforementioned pricey trains for wooden track, and the weird, in-between line that’s neither here nor there but exists just to trick you into buying a train and then when your kid gets attached to it, you have to sink a whole lot of money into the rest of the line (tracks, other trains, watering station, etc) WHICH IS COMPLETELY INCOMPATIBLE WITH THE HIGH-PRICED “CLASSIC” LINE. or, you could return the opened non-conforming train and risk having your child meltdown into a sobbing heap because they’re now convinced THAT is their favorite train. evil, i tell you. what a SCAM. to get into the top-line train set, it’ll set you back a minimum of $250-300. we cheat and combine brio tracks with Thomas trains, or even the ill-fitting ikea tracks that give Thomas the wheezes on uphill climbs, but it’s not the same and we all know it. ok, Bob the Builder is talking on his cell phone and planting ecologically correct sunflower farms which can be harvested for the seeds, the oil, and the fibers and meanwhile my kid is absorbed in some pseudo-neo-edwardian fantasy of ruddy good england? where sour-faced little trains shirk work and trick/bully each other? methinks we’ll pass on the U.K.-style hazing. Thomas LIES. * this is unforgiveable. if my child hasn’t figured out yet how to lie and disappoint people on his own, i’ll be damned if he learns how to do it from a book. who the heck is Sir Topham Hatt and why is my child learning about colonial paternalism and the overlords of the british class system? those fat dowels-sawed-in-twain-and-painted arms have got to go. the people in Thomas’ world are lumpy and static. they don’t even have fingers. or chins. again, FACES on trains. c’mon, aren’t you a little weirded out by this? the lady trains are grotesque, with drag queen makeup and faces out of a wagnerian opera. again, in Thomas’ world, the lacanian law of the father seems to rule. Sir Topham Hatt dispenses justice and runs around chastising trains with his thick dowel arms (atop a fifty gallon drum, no less). so what kind of lesson is that imparting? rich old men get to tell everyone what to do? the ruling class know what is right and wrong, and are entitled to tell (and enforce it upon) others? the child psychology is so primitive as to be pre-Freudian. there’s no sense of a child (or his surrogate, Thomas in this case) working it out for himself, or otherwise exploring an internal sense of boundary, justice, or emotional complexity. the girly trains are underdeveloped as characters and don’t seem to have much personality or initiative. again, so pre-feminist as to be laughably uncontemporary. what’s with the rigid class system (steamies vs. diesels, second class citizen cargo trains getting slammed around and thrown against fences all the time)? *there’s a REASON why this book is selling for $1.77 in the remainder bin at AllABoardToys.com: no one wants to read it to their kid. it’s like saying, “here, have a big bite of this peanut butter and mercury sandwich, with maybe some lead paint flakes on the side.” obviously lying happens in real life, but i don’t see Thomas’ lying dealt with in a very contemporary, age-appropriate way. your post gave me a huge laugh. I too am the victim of the Thomas corporation through my 4 1/2 year old son. What seemed like an innocent idea at the time (reading him little engines can do big things) turned into a 3 year (so far) adventure of ‘i want’s ‘i need’s and bad lessons when i’m trying to raise a modern little man. It IS so outdated, the concept, the lessons, even the enviornmental issue of steam trains and their black smoke. But it is an addiction with him, a true addiction. I for one am at my limit of train play. I’ve told him i’ll play anything else, but when it comes to thomas, i leave him to play independantly (one thing i’ll say is it is good for the imagination, he does make up fantastic stories while playing). Down with Thomas, i say. I never thought i could hate a smiling little face as much as i hate that grinning ‘i’m taking all your money’ mug of his. Sucked in by a corporation, yup, that’s me. thanks for your wonderful comment. i’m glad i’m not the only grump out there when it comes to those addictive little trains. will i go straight to hell for rejoicing, just a tiny bit, that the trains have been recalled due to toxic paint? i think yes. Please be sure of your facts, travelling on a steam train is STILL more environmentally friendly than travelling by car. your “Environmental Issue” of black smoke is a rare occurance with steam engines as a good locomotive driven well should make no smoke, when smoke does appear 70% of it is water vapour and that is certainly not harmful to the environment. I’m glad someone feels the same way! It is the petty little arguments that I hate the most. The trains and tracks are fine (we don’t buy any of the people), but the show, which I rarely allow, is horrible. EVERY plot is about one train hurting another’s feelings. There are even cliques. It is ridiculous. 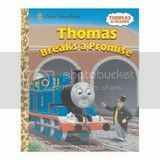 My goodness, I thought I was the only one who hated this bloody Thomas! It’s the worst thing I’ve ever seen and my 2 yrs old son loves it. I don’t mind buying little trains and tracks but don’t make me watch that! My 2.5 y.o. son recently has shown disinterest in his Thomas stuff, although I had seen it as somewhat benign (thank you for opening my eyes!). However, he now is totally obsessed with Darth Mol. Should I be saving up for the full-head tattoos and surgically implanted horns? You don’t like the faces or personalities of the characters? Ask any parent of an autistic child and you will likely find Thomas has been a pathway to improvement for exactly those characteristics. Glad autistic kids find something to respond to in TTE trains. I didn’t know that, and good for them that they find a new way to use those little engines. Got to make a couple commnets. First, While I relate. My son revieve a train table for his second birthday and was obsessed with it until after his 4th birtday. He too was the boy who likes thomas! But right now, I want Thomas back. When I mention Thomas or the short lived “Cars” obsessions, he will tell you “I don’t like them anymore, I like planets now”. One last thing! About the sexist feel of Thomas. Thomas was created in 1947. The only original trains are Thomas, James, Gordon, Percy, Henry and Annie and Clairabel.. and note the female characters are all pulled by the males.. but it’s 1947! , ALL the female engines were created later. The ONLY female engine with a personality is Emily. Then again most of the characters were created later. But how exciting is life when you have to stay on the tracks, or occasionally fall in the water or jump the tracks and need the breakdown train! But the best name is Toppim Hat who was originally called just “The Fat Controller”.. that’s right, he had no name. Sorry for the horrible spelling. Typos and not paying attenion as my 11 month old daugher destroys our Christmas Tree. In short… be thankful for thomas… but a great, well written blog on that many of us can relate to! Thank you. I just walked in the door after plunking down $30 for a cheaply made turntable that is off just enough not to fit the Imaginarium roundhouse my son got for is 3rd birthday. As I walked back to my car from the store I muttered under my breath “I hate Thomas”. So when I got home I just googled that oft repeated phrase and found myself here. $30, really? for a piece of wood and plastic that weighs less than 1/2 a lb. The toys are a screw. I have yet to buy one train myself he has received the few he has as gifts. Thanks for the heads up on the show and books. I have never nor will I ever show my son the show or pick up one of the books. I know his mother has bought him a DVD but I am going to ask her to make it disappear. Alas the boy is train obsessed as so many of our little guys are. I have discovered Whittle Wooden Trains out of Missouri. They are well made and made in the USA so I feel justified when paying $25 for an engine but the other cars are between $9 and $20 depending on the size. It is a small mom and pop company http://woodentrain.com/ check out their stuff. my 5 year old started school todayand when i picked him up and asked about his first day he did not reply.He turned to his 3 yr old brother and started talking thomas!!! i have made the decision to pack away thomas tonight forever in Tiddmouth sheds. My wife aren’t talking to me since I refuse to buy Thomas Train Table when it was on sale at ToysRus last week. I personally am not stingy on buying my 1 1/2 old son toys, but I just don’t like the idea of buying something that is expensive and not going to end. And, believe me, I tried to explain my thought to her and ended up she felt I am against on her decision. Just found this site recently and simply HAD to post a “reply. The person that actually took the time to rant about a CHILDREN’S book and TV show must have A LOT of time on their hands and really love to “hear” themselves talk. With all of the arrogant language and pontificating going on in this rant seems like someone has MORE issues than JUST Thomas the Train. Get over it, it’s just a Children’s TV show and book, surely it will not scar them for life as you seem to think it will. Maybe find a Sponge Bob site to air your grievances on…that’s a much more egregious show than Thomas the Train…and stop talking like some pompous British snob as well. but i’m sure i would find it unbearable. (Maybe even insufferable like some people… ). PS: As far as pompous British snobs go, my flames go to Piers Morgan… but that’s a different site.